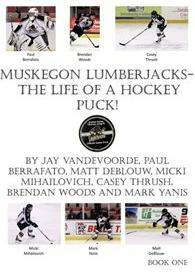 Author Jay VandeVoorde is joined by six 2010-2011 Muskegon Lumberjacks Players: Paul Berrafato, Matt DeBlouw, Micki Mihailovich, Casey Thrush, Brendan Woods and Mark Yanis in writing Muskegon Lumberjacks-The Life of a Hockey Puck! A children's book exploring what life would be like for a hockey puck in a real-life game situation at the L. C. Walker Sports Arena in Muskegon, Michigan. Follow the antics of an Official USHL Hockey Puck as he is slapped, passed, scored, and beaten during the scope of a hockey game. Experience a hockey game as the game puck even describes the rough and tumble fights that take place during a contest. Come inside Muskegon Lumberjacks-The Life of a Hockey Puck! Witness what the world of USHL and Lumberjack hockey is really like!